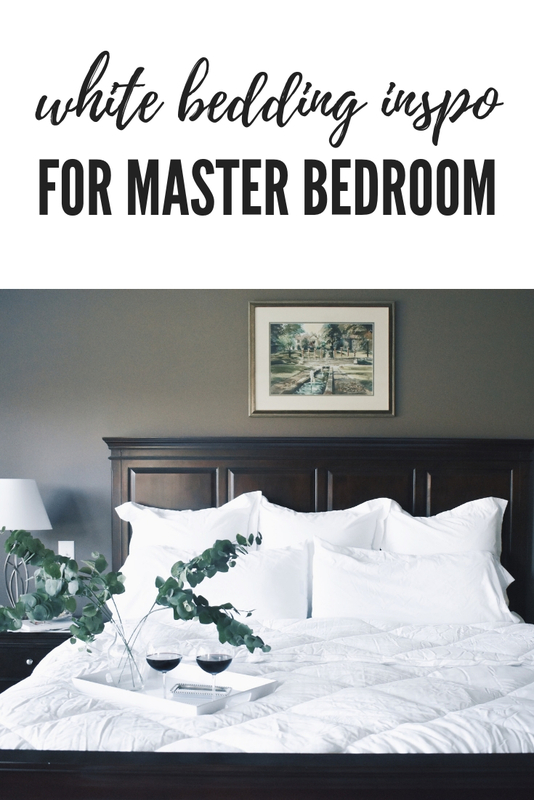 Previously, we switched up our boring beige bedding for bright white. I blogged about that transformation here. 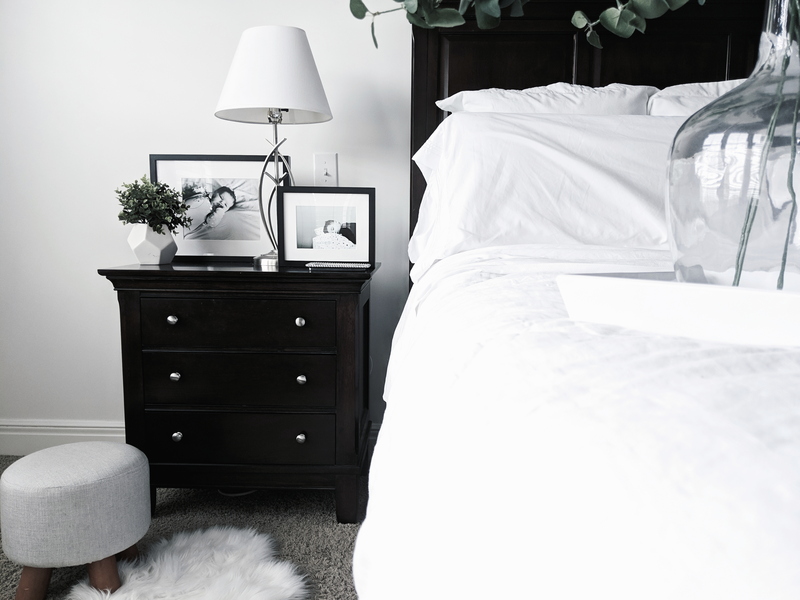 I highly recommend the switch to white bedding for many reasons–not only is it beautiful, but it brightens up the room significantly and it’s easy to bleach when needed. 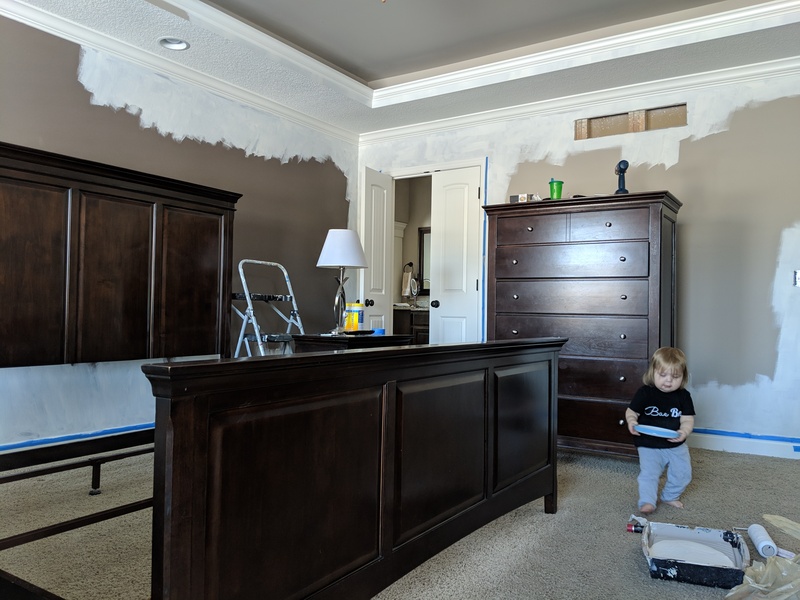 As I mentioned in my previous master bedroom post, the next step in the project was painting the walls white. I intended to start this project before 2018 ended, but that plan was derailed because of the holidays, then my surgery recovery taking longer than anticipated. Then, my mental health took a hit at the beginning of 2019 [not trying to be a bummer here, but I feel it’s important to raise awareness! ], so I took things a bit slower. Thankfully, I’m feeling better both physically and mentally now. One snowy weekend, Blair and I headed to Sutherlands in Kansas City to pick up some painting supplies. I knew we’d be snowed in for a bit, so it was the perfect time to start a home project. A big thanks to Sutherlands for sponsoring this post! 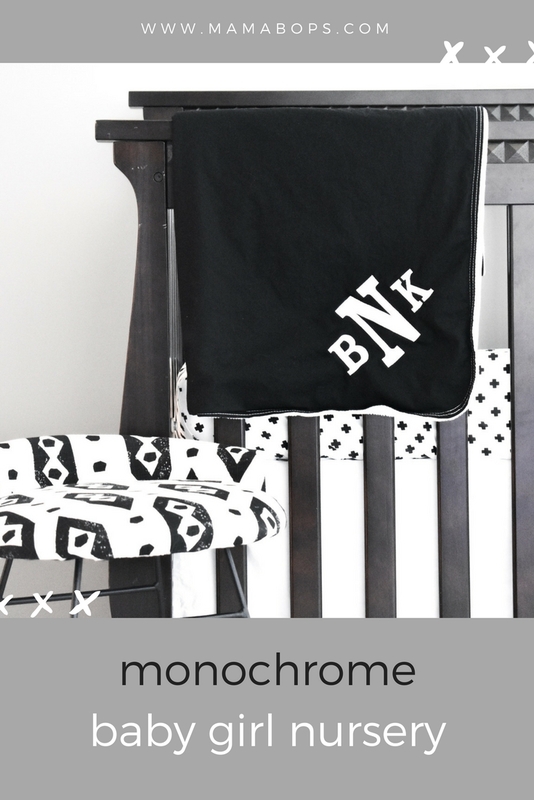 They have been great to work with both as a blogger and as a customer. We loaded the cart up with all the necessary painting supplies: paint [obviously], brushes, rollers, drop cloths, painter’s tape, etc. Pro tip: use high-quality brushes and rollers for painting. The better your brushes are, the fewer visible brush strokes you’ll have. Lower quality rollers can leave lint behind, which obviously no one wants on their walls. It’s worth the extra money to get the quality supplies so you’re satisfied with the final result. As with any project, I had my little helpers with me. This is an unedited shot of our “before” color, just to give you an idea. You can see more photos of it in this post. We also had a darker accent wall behind the bed, which you can see a couple photos above. 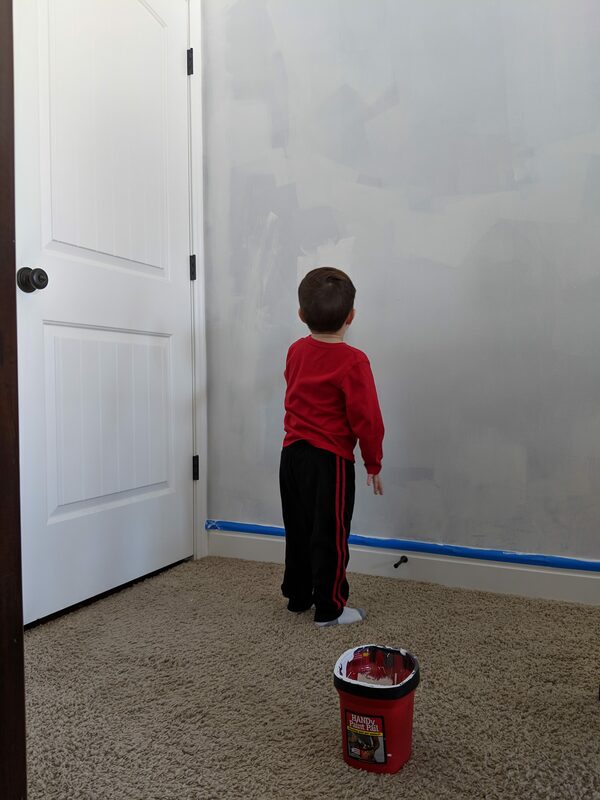 Here, Colton is helping out after a couple coats of white paint. 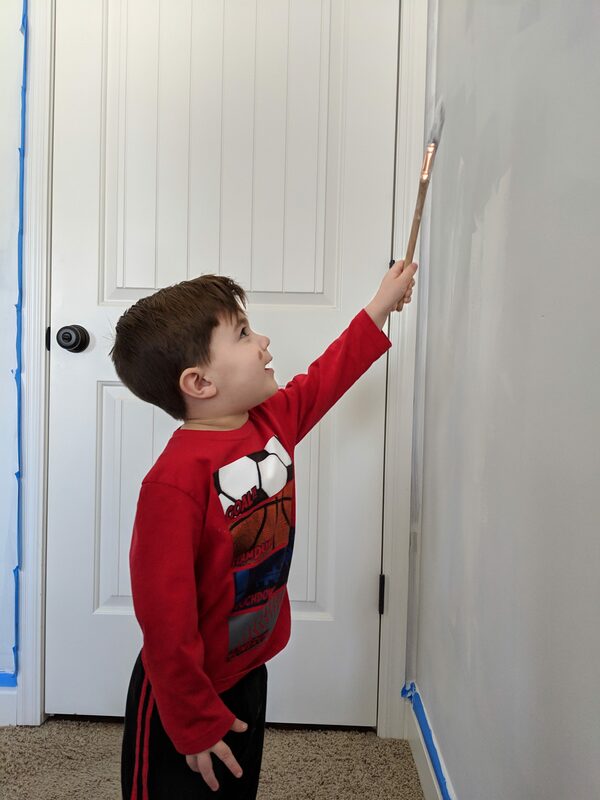 We ended up having to do 3 coats of paint, which I think is fairly typical when going from darker to lighter–especially going to white. 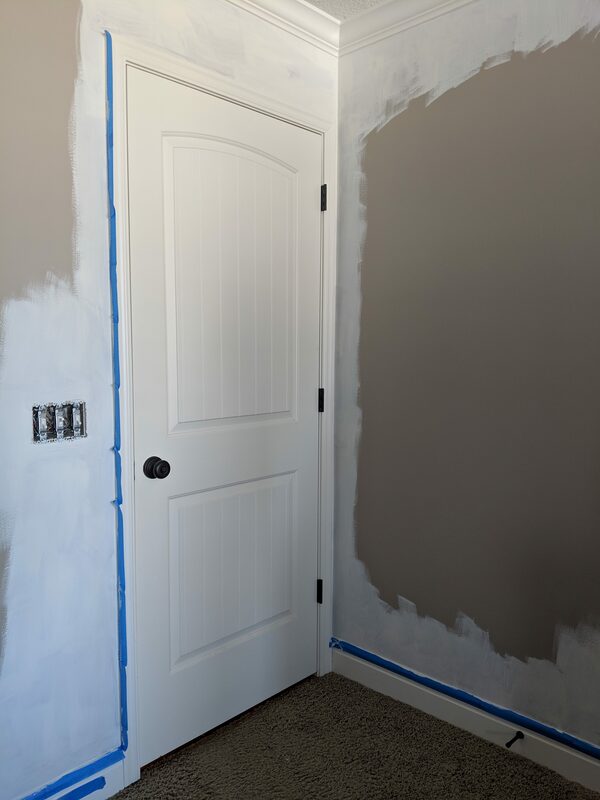 For reference, the paint we selected was Valspar Medallion Paint & Primer in eggshell finish. We had it color-matched to Sherwin Williams SW7004 “Snowbound” because that’s the white we used on our trim. Snowbound is a great cool white, and I highly recommend it for any room. You can see in this photo that we did not paint the ceiling as of yet, so it’s still the same color as the “before” walls. I was torn on painting the ceiling, as I thought having it darker might provide a nice contrast in the room. After living with it for a bit, I think we’ll go ahead and paint it–I just haven’t got around to it yet. I love the way black and white looks in our master bedroom. Obviously, I haven’t completed decorating the walls yet, but… one step at a time. I’m waiting to find pieces that I really love, like the pieces above our bed [which are surprisingly affordable!]. 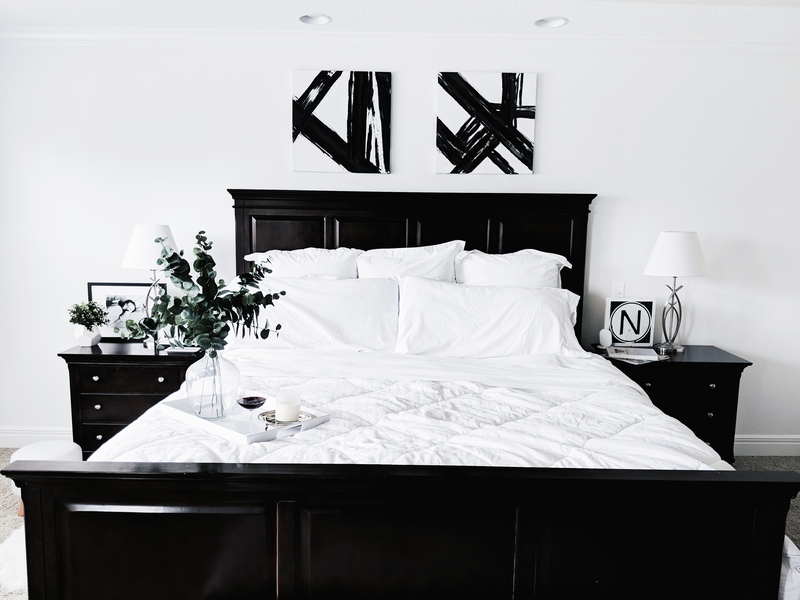 The white paint brightens up our black and white master bedroom so much! I’d also like to get a large black and white rug to put down under the bed and bench. For now, this cute sheepskin rug provides a little contrast to the carpet. Remember how I mentioned always having my little helpers with me? Haha! Blair didn’t understand why I was taking pictures of the room instead of her. She kept trying to jump into every shot… but she’s so cute I couldn’t say no. By the way, those photos on my nightstand are two of my favorite photos I’ve ever taken of my little ones. They’re always the sweetest while they’re sleeping, right? 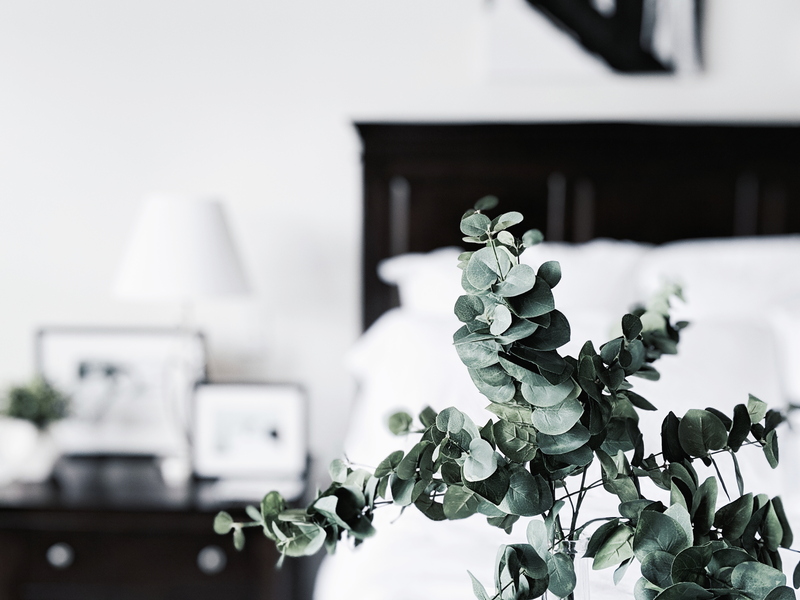 A touch of greenery helps brighten up a black and white master bedroom and keep it from feeling too stark. Since I’m terrible at plants, my greenery is all faux. 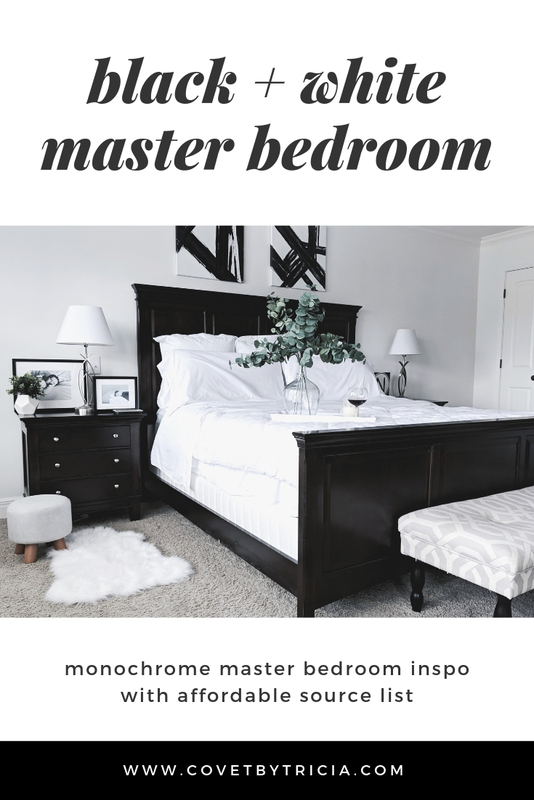 I hope this helped if you’re looking for black and white master bedroom ideas! 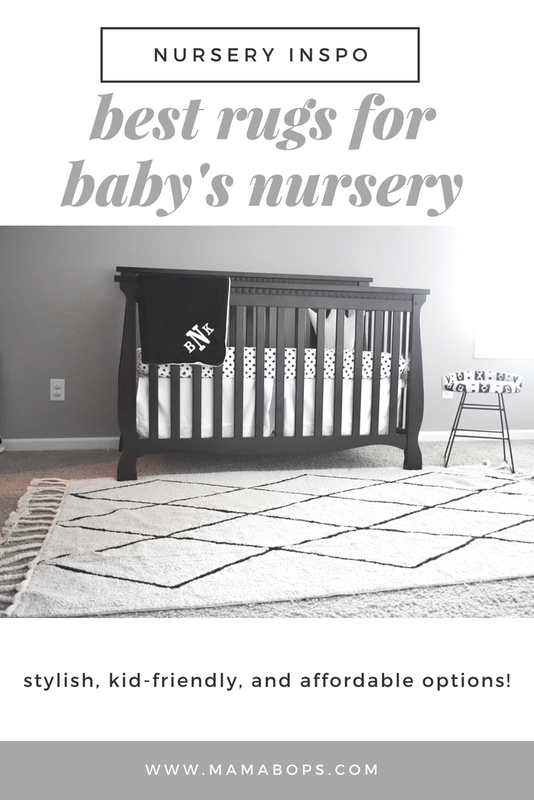 I started off doing Blair’s nursery as a monochrome baby girl nursery, then I extended the look into our entryway, and now into our black and white master bedroom. Once I finish decorating the walls in here, I think I’ll move into the master bathroom. It shouldn’t be too hard… unless I decide to paint the vanities [which, let’s be real, I’ve already decided to paint the vanities] in which case it will be a bit more of an undertaking. But this is our forever home, so I have forever to finish… right? 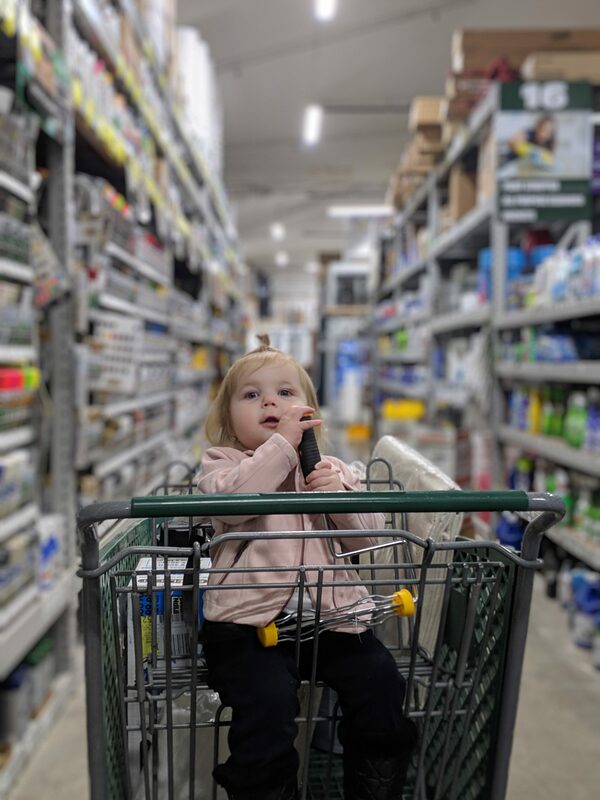 If you’re looking to start a home improvement project, go here to find a Sutherlands store near you to get started. 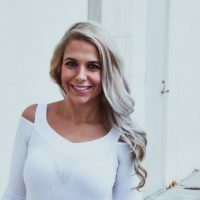 They’re a Kansas City-based company [you know I love supporting local brands!] and currently in 13 states and counting. 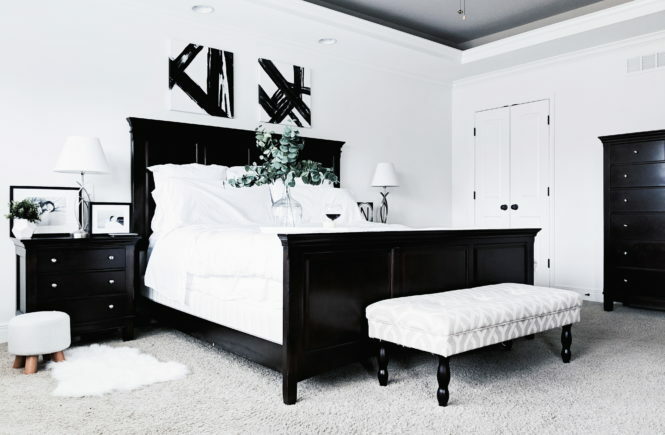 Pin these black and white master bedroom ideas for later!